Wrightstyle, one of the UK’s leading suppliers of steel and aluminium glazing systems, has completed a prestigious contract to install several door systems in the main lobby of a Grade II former grain warehouse in east London, UK, with fictional connections to Oliver Twist and James Bond. The contract at 133 St Saviour’s Wharf, now a prime residential location at the heart of a conservation area, underlines the transformation of a district that used to be a notorious slum. 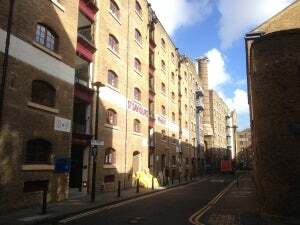 St Saviour’s Dock was where Bill Sykes, the fearsome character in Charles Dickens’ ‘Oliver Twist’, ran his criminal empire and where he met a grisly end in the mud of the dock. Wrightstyle supplied four sets of doors, three of which were access-controlled Schuco Jansen E30 systems. The fourth was a Schuco Janison E130 system, installed as a fire exit door and providing 30/30 insulation and integrity. The contract was carried out on behalf of the St Saviour’s Wharf Company and the architect was Carver Haggard, with a design brief to provide functionality and an exceptionally high level of quality, in a residential area where apartments sell for well over £1m. The contractor was Kent-based JSP Building Services. The wharf was converted into flats in 1987, which are now being upgraded. The wharf itself runs down to the tidal waters of the dock, the mouth of the old River Neckinger, which is now entirely enclosed and runs underground. The river took its name from the term ‘Devil’s neckcloth’, the noose that London vigilantes used to hang pirates found looting moored ships in what was the largest warehouse complex in London. The area is now characterised by upmarket apartments, bars and restaurants. However, it was described by Charles Dickens in 1838 as the ‘filthiest, the strangest, the most extraordinary of the many localities that are hidden in London.’ The Morning Chronicle newspaper described it as ‘the very capital of cholera…the Venice of drains’ in 1849. St Saviour’s Dock was created in the 13th century by the monks of Bermondsey Abbey. Based in Devizes, Wrightstyle supplies a comprehensive range of steel and aluminium internal and external systems, including curtain walling, and internal fire screens and doors. The company supplies its systems worldwide and is able to offer an end-to end service, from design and fabrication to installation by its own network of trained installers, with full guarantees at each step. Wrightstyle supplies its own ranges of steel systems, offering the highest levels of protection against fire, ballistic and bomb attack with high wind-loading properties and is also an approved Schuco supplier, therefore providing either steel or aluminium solutions for a comprehensive range of specifications. The wharf has one further fictional connection. In the 1999 film, ‘The World Is Not Enough’, James Bond traverses the length of St Saviour’s Dock in a speedboat.